This will be a brief post–I’m just wanting to get these thoughts out of my head and onto our blog while they’re fresh. Our Crush puppy (a Vizsla) will turn a year old in January. Hard to believe. She still acts like a 6 month old (this is a topic for another blog post I’ll save for another day–allowing your pups to mature based on their own temperaments/personalities and not according to other pups or their littermates). Because she was born at the end of the pheasant season getting her on wild birds before now was pretty much impossible. She’s been exposed to plenty of pen-raised birds since she was an 8 week old pup. This is better than nothing, but we all know pen-raised birds can invite a whole slew of other problems with bird dogs–especially the inexperienced ones. We’ve had Crush out a few times so far this season. I forget how much fun it is to watch the babies learn how to use their noses. Half the time she isn’t really sure what she’s tracking. All she knows is it smells good! Most other times, she’s way behind the eight ball. The adults have already established a point on a holding bird (sometimes she naturally honors their points…other times she runs around oblivious…other times she runs around them with her nose to the ground as she works hard to locate the bird they’re pointing) or they’ve moved on past scent/hotspots. She’ll come trailing along hitting most of the same spots they’ve oh-so-subtly indicated then moved on. 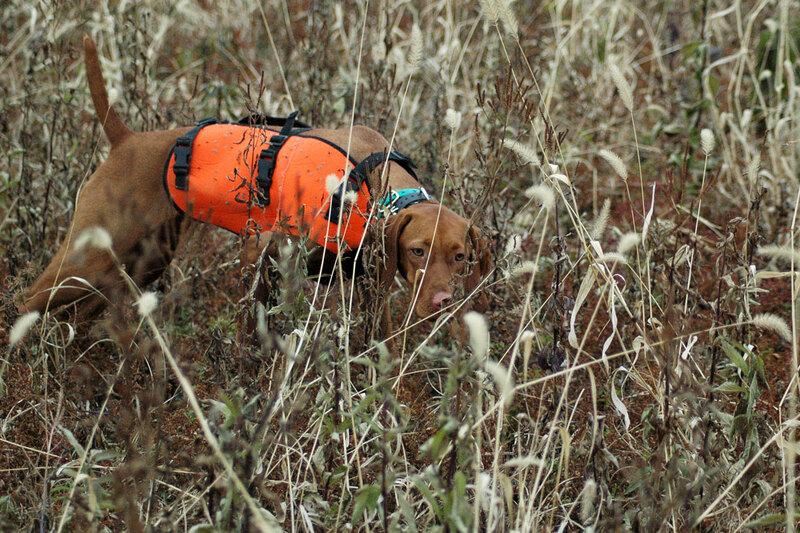 Sometimes we put her down alone…sometimes with one of the experienced gun dogs. Sometimes she sees the bird flush…sometimes she sees the shot bird drop…sometimes she runs clear across the field in hopes of finding where the unharmed bird landed. We’ve watched her push birds too hard causing them to flush…likewise we’ve seen her sometimes apply those lessons and move with caution as she determines the scent is stronger. We’ve watched her hit some pretty hostile cover while on scent–and make the choice to move through the discomfort. Pretty cool. The point of this post is to impress upon you the importance of exposing your pup to wild birds as often as possible. Oh, and notice I said exposing–NOT SHOOTING. Big, big, big difference. I’ll write another post about how important it is to PROPERLY expose pups to shotguns (hint: No, it isn’t a good idea to take your pup for a walk around the shooting range or to put your pup down in a field with numerous guns in order to acclimate them). Trip (Ch Boulder’s N Fusion’s Power Trip MH) as a puppy holding point on a covey of wild quail.